This year's Grammys were supposed to be different; in the end, they chose to award the status quo. This year’s Grammy Awards seemed poised to be more politically and socially aware than ever. On the red carpet, celebs donned white roses in support of the Time’s Up movement, following the lead of the Golden Globes, where women wore black and took a bold stand against sexism in their industry. So when Kendrick Lamar, the first performer of the night, took the Madison Square Garden stage in front of the American flag, backed by men dressed in military garb, it was an auspicious start. Ultimately, though the event fell flat. The Grammys’ new woke identity was right there on the tee, but when the Recording Academy finally took its swing at something bigger, it still missed. Despite Lamar’s electrifying performance (which ended with dancers in hoodies cut down by the sounds of gunshots) and several other purposefully pointed moments, the Grammys never really found their footing. Early in the broadcast, pop star Alessia Cara won Best New Artist, but there would be no other major female wins for the rest of the night. 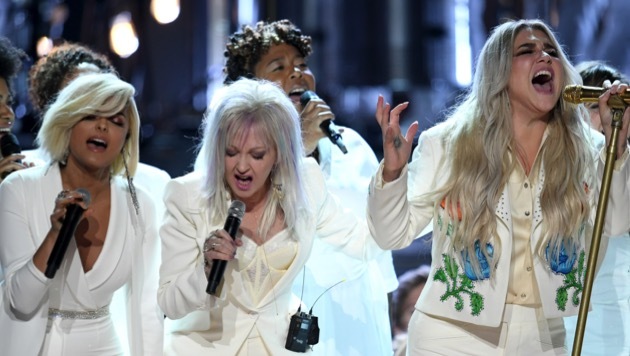 Later, Janelle Monae introduced Kesha with a firm “Time’s Up” warning for the music industry: “We come in peace, but we mean business.” With help from artists including Cyndi Lauper and Andra Day, Kesha offered a gut-wrenching performance of her song “Praying,” which alludes to her former producer and alleged abuser, Dr. Luke. “I’ll bring thunder, I’ll bring rain / When I’m finished, they won’t even know your name,” she belted, verging on tears. Moments later, her gutsy declaration was devalued when the trophy for Best Pop Solo Performance was delivered to Ed Sheeran—the only male nominee in the category. While he admitted that he doesn’t “have personal experience of those kinds of brick walls that [women] face,” and that it’s upon the whole industry “to make the welcome mat very obvious,” his comments were shockingly tone deaf for a guy who works in music. Many women who are, in fact, musicians, engineers and producers don’t receive the same recognition or opportunities as their male counterparts. It’s not like the music industry is that much different from every other industry. The big winner of the night was Bruno Mars, who took home the Grammys’ big three awards: Record of the Year (“24K Magic”), Song of the Year (“That’s What I Like”) and Album of the Year (24K Magic). An adept performer, Mars can certainly generate a stellar radio hit, but by crowning him the king of 2017, the Grammys abandoned their progressive agenda and reverted directly to their most oblivious impulses (like sending Beyonce home empty-handed in 2015 and 2017), where entertainment value trumps all. If Kendrick Lamar or Lorde—the only female nominee for Album of the Year—had won the big prize, or if SZA had won anything, it might have signaled the Grammys were committed to real change, or at least to moving forward. Instead, their effort to appear socially relevant exposed them as, once again, out of step. An important moment came when Maren Morris and the Brothers Osborne sang “Tears in Heaven” in honor of the victims of gun violence. But then Camila Cabello’s rousing pro-immigration speech was followed by an immigration-themed performance by U2, whose most famous member, Bono, recently criticized modern rock ‘n’ roll as “too girly.” It was hard to make sense of the mixed messages. Perhaps the Grammys’ worst offense was pledging allegiance to the Time’s Up movement and then failing to recognize talented female artists. Portnow can spin that any way he wants, but ultimately, that’s on him. If this year’s ceremony proved anything, it’s that the old system behind the Grammys remains desiccated and needs to change, and that it’s going to take more than one night to do it.